Just a few months after it unleashed the much-hyped Naked Chicken Chalupa featuring a fried chicken shell, Taco Bell's new nacho-style chicken spinoff -- Naked Chicken Chips -- came out nationwide on Thursday. 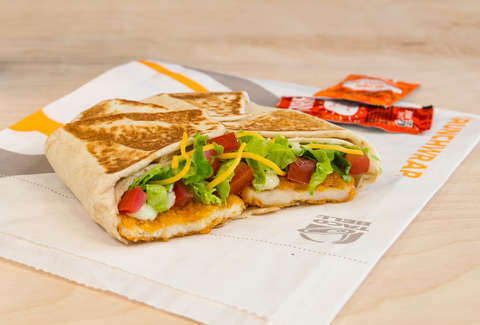 The chain's new Chickstar Crunchwrap, however, takes the fried chicken chips to the next level. That's right: Taco Bell announced that the Chickstar is back and available at its locations nationwide, but this time, with the new Naked Chicken Chips inside. Along with a layer of the fried chicken triangles, the Crunchwrap comes stuffed with avocado ranch, shredded cheddar, diced tomatoes, and lettuce. Basically, it's as if T-Bell deconstructed the Naked Chicken Chalupa and stuffed it all into a big flour tortilla. One of them will set you back $3, while a six-piece order of the Naked Chicken Chips by themselves costs $2. The Chickstar has appeared on Taco Bell's menus in various forms over the years, but now that the company is going all in on its new 'Naked' chicken, this latest version makes perfect sense. All it's missing is a layer of hot nacho cheese, but then again, you can always ask for that as a customization. You know what to do. Tony Merevick is Cities News Editor at Thrillist and suspects more fried chicken stunt foods are on the way. Send news tips to news@thrillist.com and follow him on Twitter @tonymerevick.